My last post explored ways to teach about the Four Noble Truths, and I want to continue that here. One of the most challenging ideas to convey is the idea of dukkha – the dissatisfaction, dis-ease, stress, unhappiness, suffering that, according to the Buddha, pervades the unexamined and unawakened life. It can be easy to tell students about this idea, but the mere telling doesn’t guarantee that the students will understand or appreciate the idea in any kind of complexity. The video begins with his compelling argument against children using cell phones: they hinder the development of empathy. Louis CK asserts that when children try out being mean in person, they see the pain their words cause, and then learn the connection between their actions and the pain of another person. Texting, by contrast, removes us from the person we harm with our words – and, more important, from seeing the effect these words have – and all we are left with is the pleasurable buzz that comes from engaging with technology and asserting our will over another person. You need to build an ability to just be yourself and not be doing something. That’s what the phones are taking away: the ability to just sit there….That’s being a person. Because underneath everything in your life, there’s that thing, that empty, that forever-empty…the knowledge that it’s all for nothing and you’re alone. It’s down there. And sometimes when things clear away, you’re not watching it, you’re in your car and you start going, ‘Oh no, here it comes, I am alone.’ It starts to visit on you, this sadness. Life is tremendously sad, just by being in it. That’s why we text and drive. I look around and pretty much 100% of people are texting and driving. And they’re killing…everybody’s murdering each other with their cars. People are willing to risk taking a life and ruining their own because they don’t want to be alone for a second…. This is it! Louis CK is pointing out dukkha to us: it is a broken leg or a broken heart, yes, but it’s also something deeper. He’s pointing to the subtler forms of dukkha: the pain that comes from the transitory nature of things, both those in the external world (people, pets, relationships, pleasurable situations) and in the internal one (my own declining memory, vision, strength, and faculties, combined with the certainty of my own mortality and the uncertainty of its time). He’s also pointing to the Second Noble Truth. The ways in which we respond to this dukkha tend to promote more dukkha for ourselves and others, whether that takes the form of texting and driving or being cruel to others via text message or any of the other number of ways a person might unskillfully respond to her experience of pain. He even points to a potential way out: rather than running away from the experience of pain, he says, we could turn toward it. We could face the dukkha, sit with it, experience it, and try to understand it from the inside. This kind of advice would not be out of place on a vipassana retreat: feel the physical sensations associated with loneliness and loss, we might hear, and abide in them without wishing them away or indulging in them repetitively. If we do this, as he suggests, we might find a kind of peace – even a kind of freedom. But that can only come if we are first willing to turn toward our experience (especially when it’s painful) and then to experience it fully. I was grateful to feel sad, and then I met it with true, profound happiness. It was such a trip. The thing is, because we don’t want that first bit of sad, we push it away with [various sense pleasures], and you never feel completely sad or completely happy. You just feel kind of satisfied with your products, and then you die. So that’s why I don’t want to get a phone for my kids. 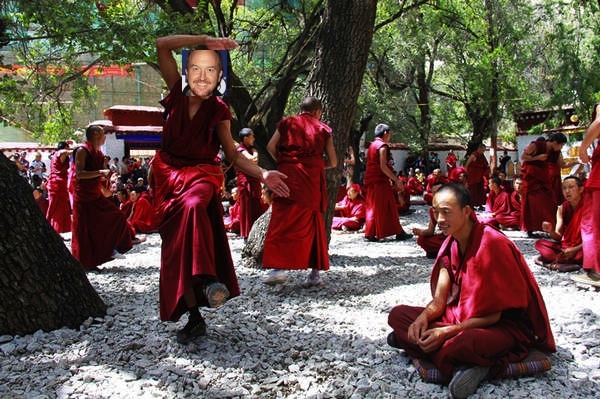 This entry was posted in Buddhism, Lesson Plans and tagged Buddhism, Buddhism lesson plan, dukkha, Four Noble Truths, Four Noble Truths lesson plan, lesson plans, louis ck, suffering, teaching by teachingasianreligions. Bookmark the permalink. I loved this! Not only the focus on all-too-current practices, but the unexpected (although it shouldn’t be) connection to comedy. Both religious reflection and comedy confront painful topics and transform them into something meaningful. Welcome to the blog! Thank you for your comment. Perhaps the court jester is an example of a figure who embodies this connection between truth-telling (no matter how painful) and comedy. There seems to be a need to first see clearly. Then one can begin the process of transformation, as you suggest.